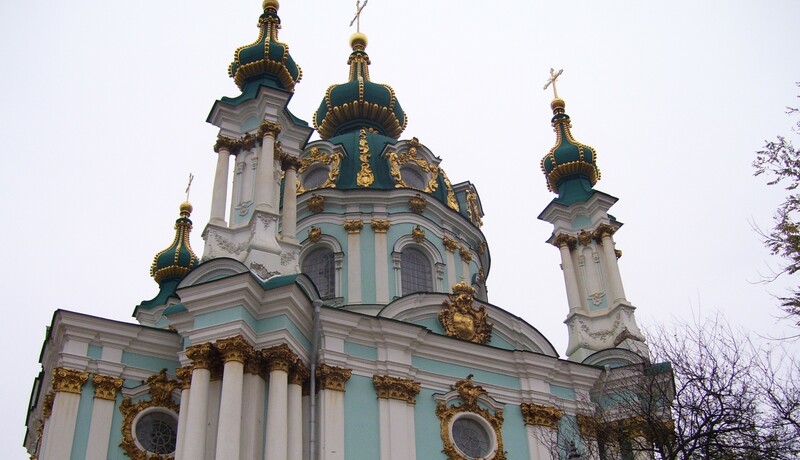 Today, in honor of Ukraine’s Independence Day, I’m taking a look back on a trip to Ukraine in the summer of 1999…. The drive from Borispol airport to Tyotya (aunt) Clara’s apartment deep inside Kiev–in the same building where my mother had grown up–was speedy. This was thanks to our driver, who traveled well over the speed limit. Somehow, we were comfortable on this cramped journey: my mother, my aunt and me in the backseat, the two unidentified men (hired drivers) in the front. All three of our suitcases had fit snugly in the trunk of the boxy black Audi, and each of us in the back held a bag upon our lap like a small child. We entered the city of 2.5 million within half an hour. Every store sign and street marking was in the Ukrainian language, not Russian. Tall, off-white buildings were sprouting out of the ground, side by side by side. Thousands of tiny little windows with tiny little balconies were strung with washed clothes and colorful sheets. In between patches of buildings, there were rectangular holes in the sidewalks where people slipped in to get to the metro. It seemed very secretive, everyone disappearing amidst blue-and-white tiled walls, trusting to be carried away and reappear somewhere familiar. People walking the streets wore nothing out of the ordinary. Most of the pedestrians were men. 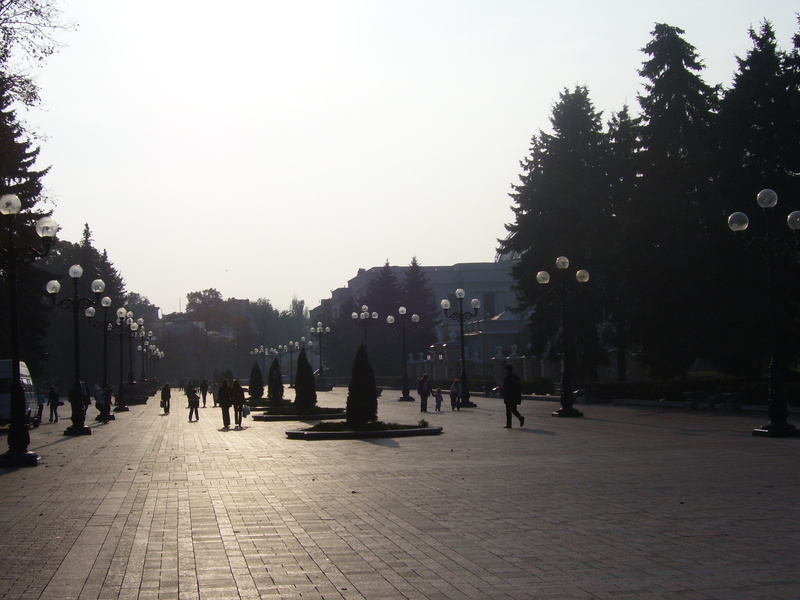 It was simply another grey day on my arrival in Kiev and it looked like everyone was used to that. As we got closer to my mother’s old apartment, her childhood home, the strange man in the passenger seat loudly announced that her old school was somewhere in the area. My mother’s excitement poured freely, after all she was not a foreigner here. She leaned and squinted and pointed at every other building. There it is, oh, no—wait. Her sister, my Tyotya Tanya, joined in, and the two were squealing and gasping together like school children. Then a few minutes before reaching the apartment, the man in the front boomed out that the building in front of us was the actual school. My mother agreed and shouted happily at me, look, look, there it is! From the back, our first view, the apartment building looked dilapidated. Every year since we had last visited seemed to peel off another layer of old green paint chips from the door, crumble off a few bits more from the stone balcony. As I was wondering how the sagging stone still managed to hold up, a woman shouted out from her balcony on the left end of the building, three stories up. She was waving wildly, moving brightly colored lips. Before I could ask who the woman was, I had to turn away to help carry our luggage upstairs. As we entered through the cracked green doorway, a very short, plump woman in a plain black dress and a mop of white hair popped quietly out of an apartment door. I found myself being tightly hugged, and I smiled awkwardly. This can’t be Tyotya Clara, I thought to myself in shock. She’s so old, she can’t be so old. How many years has it been? I tried to rapidly wade through fading memories of past visits. I pointed my bewildered face toward my mother over this little woman’s shoulder. T. Clara had bold chunks of short red hair pressed into stylish curls all over her head. She always declared her presence as if she were speaking before a rally. The woman accosting me now was peeping like a kitten, soft and meek. To my relief, my mother continued on up the worn stone steps. It had not been T. Clara. My fear of growing old retreated as I freed myself from the little woman. T. Tanya already was bustling about the apartment, talking to anyone who would listen. And then I saw her. Actually, first I heard her, her clear, emphatic phrasing. She appeared in the doorway and jumped out to greet my mother. Her red hair was not red anymore, but it was still short, and at the moment, rolled up in long silver curlers. I smiled to myself at how very adorable she was and hoped I too would still groom myself to perfection when I reached her age. Once my mother had been appropriately cried over, it was my turn to be hugged and kissed and squeezed. The torrent of exclamations regarding my height and face and hair began, and in my jet lagged state, my translations did not keep up. I stood among the open-mouthed suitcases as the conversations headed off like a pack of racing bicyclists. The next day, I was already feeling as if I belonged in this place that I should have remembered. I went with my cousin Sasha to his friend Misha’s apartment, because Sasha had a CD-ROM he wanted to try out and Misha had a computer. His friend opened the elegant black-padded leather door and greeted us. When we followed Misha to the room where the computer sat, three boys, Misha’s brothers, ranging in age from 10 to about 25, clad only in shorts in the hot apartment, came into the room one by one. They seemed to sniff at me like dogs at a new dog. I gave a little smile and observed them as specimens of Ukrainian youth. They smiled back and left. Both Misha and Sasha seemed to expect me to know how to install the CD-ROM, but I could not understand all the Russian computer commands. But somehow, with much laughter and confused translating, we were able to open the program. In much less time than it had taken to run his program, Sasha got bored, so we three decided to go walking around the city. In the pressing heat, we climbed slowly up the spiraling and ancient cobblestone road known as Andreevsky Spusk, where artists sold their paintings and crafts along the sidewalks. The ice cream I’d bought on the way was already dripping down my fingers and onto my leg until I finally had to throw it, wrapper and all, under a bush as directed by my guides. “Now that’s a real Ukrainian girl there!” Sasha laughed. A thin, black metal staircase appeared near a café and we climbed that too, reaching a popular lookout point from where much of Kiev could be seen in one breathtaking view. But the sun, toward which we had voluntarily ascended, was melting us, and I suggested that we make our way back down. So I followed the guys in a different direction from which we had come, and we traveled a level path for some time. Suddenly, arriving at a clearing in a grove of sweet-smelling trees, I realized that there was a large, dark gray statue looming above us. It was the statue of Prince Vladimir, and according to Sasha, the smaller figures at his feet, were his children. Sasha and Misha both began to laugh, and I realized then that I also should. Our trek back to the apartment was rather leisurely. A small breeze from the Dnieper river had reached us. We stopped at a kiosk to get something to drink. With our non-alcoholic glass bottles, we sat in a small park with green wooden benches enclosing a fountain, several beds of colorful flowers, and three sweaty men with lawn mowers. I sipped on “Tarhoon,” a green and bubbly liquid made of “mountain grasses” as Sasha had put it. This amused me into trying the beverage, and it turned out to be quite tasty, reminding me of some herb that my mother grew in her garden. As we finished off our drinks, an old and slightly hunched lady hobbled over to us. Sasha handed over his empty bottle to her and then she looked at me and my bottle. I swiftly gulped down the last bit of my mountain grasses and extended the bottle to her. Sasha explained that she would be able to take these bottles in somewhere and receive a bit of money for them. Misha had finished his drink much before us, so I asked him where his bottle was. He grinned widely, laughed, and then asked me where my ice cream wrapper was. I laughed with them. There was nothing I could say to that. On a Saturday morning, we left Kiev and headed to the Ukrainian countryside by train to where my aunt lived. During the train ride, we witnessed numerous varied characters selling their wares, indifferent to the sweaty passengers. It was a dilapidated parade of sagging faces and coarse voices, offering everything from newspapers and ice cream to hot piroshki and clothespins to paintbrushes and shoes. Even a bit of entertainment came along in the form of several musical parties. One consisted of an old, bespectacled woman pushing along her blind, stumbling husband who played the accordion not too unpleasantly. The couple pushed up their strong and pleasant voices in sad harmony with the music. A second group also included a man (fine of sight) with an accordion, a young man with a shockingly long trombone that had outworn its shine, and a third younger fellow who carried a small violin case containing a few lonely coins. As he passed my mother, she placed a wrinkled paper bill into his curled fingers. The heat felt stronger in the little village of about 500 where my aunt had made her home. She had been only 30 years old when she tired of the city life in Kiev and decided to leave. After resting and eating, the plan was to go to the post office and the grocery stores in the center of the village, a half hour’s walk from her home. 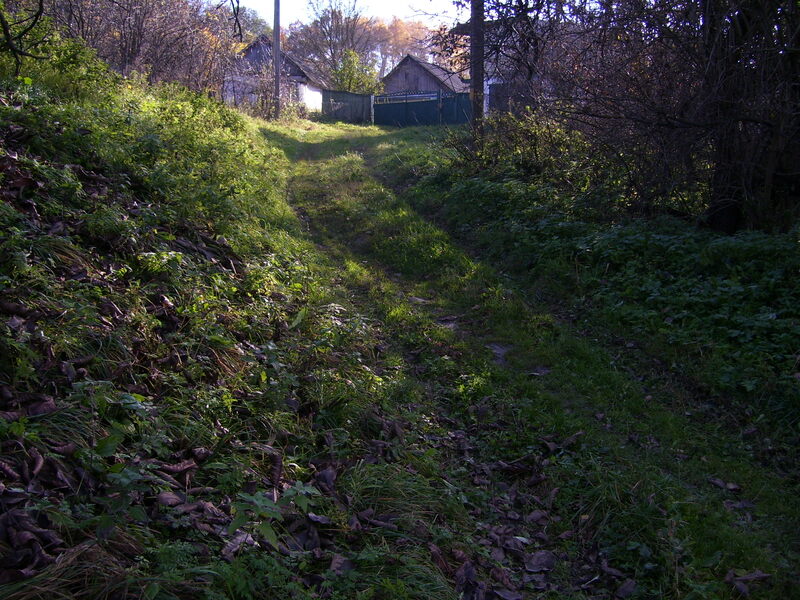 My aunt led us down the grassy path from the dacha. Here and there emerged bits of trodden and dried earth, attempting to resemble a road. Tall weeds rose up on either side. But they were very pretty weeds; lots of bold purple, white, and yellow petals armored by rich, green, and jagged-edged leaves. Small white butterflies swam silently by my nose. To carry the items we would purchase, my aunt had brought along a bag on wheels, now empty, that she dragged along the bumpy path. My aunt was telling my mother that since the selling of products on the street had been legalized by President Kravchuk, this little bag-on-wheels had been named in his honor; we would be toting our purchases in a kravchuk. Soon we reached a paved road, but instead of any vehicles, I spotted a large brown cow, chewing, blinking, swatting its tail. It stood lazily on the edge of a field that belonged to a bright blue cottage. Also near the house was a small river where ten or twelve ducks squawked noisily through hard orange beaks, coated in feathers of the purest white. Once we had overcome the hill in the road, there were a few more houses enclosed by quaint wooden fences, painted white or green or brown. Then there was a building on our left that my aunt told me was the “village club” with a discotheque. The grim white columns that graced the front of the building gave it an air of a colonial mansion from the American Civil War era. I tried to imagine flashing strobe lights, pounding music, and sweaty dancing village people in kerchiefs and garden-stained clothes. Our hike continued, wild flowers framing the sidewalk that had appeared suddenly, splotches of dried cow dung adorning the road. A mother hen and her fluffy grey babies scurried out of our path as we approached them. 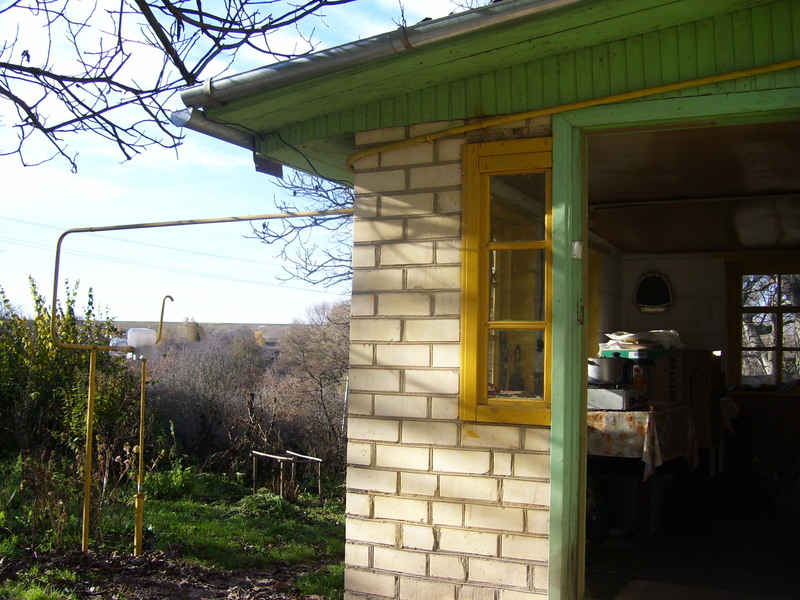 My aunt steadily pulled her brown kravchuk and spoke about the changes in the village recently. As we passed a rundown building she pointed with her forehead at it and said, “That is the church. It used to be a bar.” We finally reached a small, whitewashed building with light blue shutters and my aunt slowed her pace for the first time. The sign read ‘apteka’, or drugstore. But as we entered, my mother was already shaking her head at me and saying, “It’s a post office.” The two women behind the counter acted as if they had never seen a parcel before. At least a half hour’s worth of fiddling with paperwork passed by until our box was finally wrapped in brown paper, tied with string and sealed with something that looked like hot fudge syrup. I asked my mother what it was, but she had to ask my aunt. When one of the employees, a plump girl who had served herself a heaping plate of blue eye shadow, overheard my aunt’s explanation of the sealing process to two ignorant Americans, she laughed and said, “You don’t have this in America?” She smiled widely. It was the first thing I’d actually seen her do since we had been in the post office, this laughing and smirking. While our parcel was being finished off by a slim, wispy-haired girl, this haughty plump girl pretended to look busy again with some paperwork that she was turning over and over. Finally, the exhausted slim girl looked up at my aunt who had been holding the money ready in her hand. We left. My legs were aching to sit, but I was glad to be outdoors again. We walked on, encountering a few women in the typical combination of kerchief and flower print dress. They each carried some sort of bag, weighed down probably by recent purchases of bread and potatoes, perhaps some butter. We passed several little boys on the sidewalk spinning the wheel of an upturned bicycle, talking loudly. Then in front of me there was a store with a bench waiting before it, like a storefront in an old western film. Several people sat and waited in the shaded heat. My aunt led us into the cool, quiet store that she informed us was one of the latest additions to the chain of privately owned stores in the village. All the stores had been government owned during the Soviet days. Only three people were within the dimly lit store: an older woman sat at one of the small white tables with a little blonde-haired girl. They were chewing silently. The one employee working in the store was a weary looking lady who reluctantly detached herself from her book and stood up as we entered. She waited with an expression of utter boredom as my aunt scanned the scantily clad shelves for what we needed to buy. After discussing with my mother in her breathless rush of a voice, she asked the lady for two beers, a loaf of bread, a carbonated drink and an ice cream for me. We gathered the purchases and piled them into the kravchuk. At long last it was filled. My mother and aunt sat down, busying themselves with the ‘sports drink’ that they had discovered, as I discovered a whole new version of ice cream. With every bite, it tasted more and more like butter. My aunt had to finish it for me under my mother’s disappointed gaze. As we stood to leave the store, I noticed the two girls from the post office enter the store and begin conversing with the bored store lady. I looked at my watch, almost 11 o’clock. The post office, according to its sign, supposedly closed at noon. I looked questioningly at mother who turned to me and told me that they had closed early to do their marketing. Previous Previous post: How to get FREE flights and housing abroad–seriously.